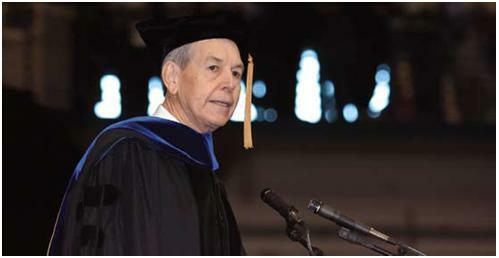 Dr. Jesse D. Jones is a Marshall County, KY., native and a 1964 graduate of Murray State University. After college, he went to work for the Ethyl Corporation in LA, later at the divided Ethyl and Albemarle corporations. For 32 years, Dr. Jones worked in Research and development, co-authoring 19 patents. After retiring, Dr. Jones continues working as an investor. Through his generosity, Dr. Jones ensured the completion of the clock tower on the new science campus, named after his late father Jesse L. Jones. Dr. Jones also provided funds for a satellite library named for his maternal grandmother. He has funded the creation of both the Racer Writing Center and the Racer Oral Communication Center in Waterfield Library. In addition to many other contributions, Dr. Jones has also created several outstanding awards and scholarships. The Jesse D. Jones Writing Certificate Program recognizes Murray State University students who have worked to improve their knowledge of and experience with writing. Students who attend a combination of writing workshops and writing center sessions designed to develop writing skills may apply for a certificate. The certificate indicates to employers, faculty, community leaders, and others who value excellence in written communication abilities that the student has completed ten or more hours in additional writing instruction. Five completed Racer Writing Center sessions. Completing the requirements listed above will earn a certificate stating that the student has completed ten hours of additional writing instruction. Certificates may also be awarded for additional sessions (twenty, thirty, etc., hours of additional writing instruction). This program honors the vision of Jesse D. Jones, who realizes the competitiveness of the job market and how effective communication skills will help Murray State graduates be successful.